A new outdoor community walking program, Just Walk Hamilton-Burlington, has launched with the help of the City’s Neighbourhood Community Matching Fund. Led by local health-care professionals, the program will host 12 walks in Burlington between February and September. With this program, Burlington joins communities across Canada affiliated with the global Walk with a Doc organization. The first free, fun and supervised walk of this year will be on Saturday, Feb. 23 at 9 a.m. with Physiotherapist Jake Tumber at City View Park, 2500 Kerns Rd. Tumber and the Just Walk team will meet participants at the north parking lot near the soccer fields at City View Park. The walk will start off with a short educational talk on “Walking Mindfulness,” followed by a guided walk at your own pace. Each walk is open to all abilities and pre-registration is not required. To learn more about Just Walk: Hamilton-Burlington and join the Just Walk email list for upcoming walk dates and locations, visit justwalk-hb.weebly.com. 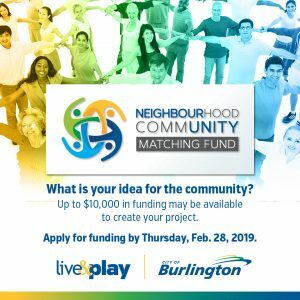 The deadline for applications for the Neighbourhood Community Matching Fund is Thursday, Feb. 28. Head to burlington.ca/matchingfund to apply. The fund provides up to $10,000 to support projects led by neighbourhood and community groups. In 2018, $20,636 has been awarded to support community projects. 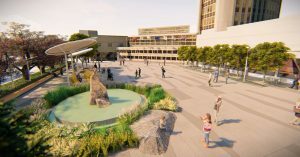 Approved projects receive up to 50 per cent of the funding for the project from the city. 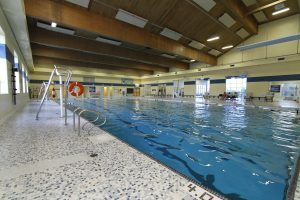 The neighbourhood groups then match this funding with an equal value through any combination of volunteer hours, donated services, donated materials and supplies or other funds raised. This is absolutely fabulous. I will make sure I forward this new venture to all my contacts.